Hi Friends. In the previous post we discussed the Strategy – Short Call. In it we focused on taking the advantage of the slide in the prices of the undertaking. It was a good strategy for fall in the prices, but with a disadvantage – unlimited loss compared with limited profits. Today we will discuss a strategy, where we will again try to take advantage of the falling prices of the underlying. But in this strategy, there is a potential of unlimited profit compared to limited loss. 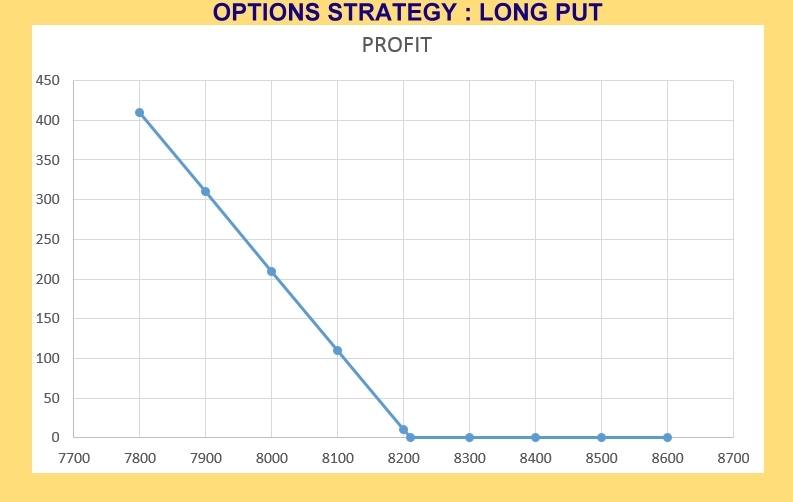 The Long Put strategy is a simple option trading strategy. In this strategy, the options trader who buys a put option, believes that the price of the underlying security will fall significantly beyond the strike price before the Options contract expires. This strategy is for aggressive traders who are extremely bearish on the stock / index and want to exploit the perceived downside trend with limited risk of loss. Risk is minimal and is only limited to the premium at which we purchased the Put. The maximum loss that we can incur is the loss of the premium. Unlimited profits as the stock or index can fall to any level before the expiry. When can we achieve the breakeven? NIFTY is currently trading around 8400. Let’s assume you are extremely bearish on NIFTY. So you buy one lot of current month Put with 8300 strike price for a premium of Rs. 90. The Long Put strategy limits the risk of the loss to the premium paid by us for a particular Put option (Rs. 90 in our case). 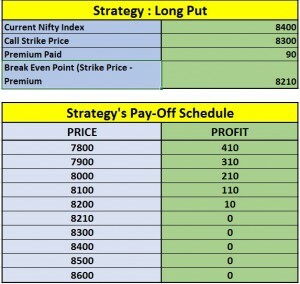 But the potential to earn profits is unlimited if the Nifty falls beyond 8300 strike price. This strategy is the simplest way to earn money if you believe that the market will move southwards.